Gather data to be presented by the report. Define how the data is formatted and displayed in the report. The primary goal of Zen reports is to enable you to create reports based on data in a Caché database. To increase flexibility and power, Zen reports can also incorporate data from other sources. 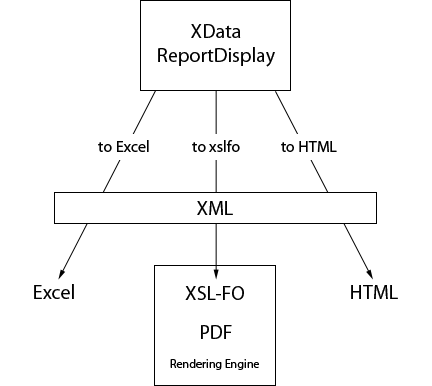 The XML generated by the ReportDefinition must have a structure suitable for processing by the XSLT stylesheet generated by the ReportDisplay. If the ReportDefinition block does not provide XML in the correct format, you can invoke an additional step and use an XML stylesheet to perform additional transformations prior to generating the report output. 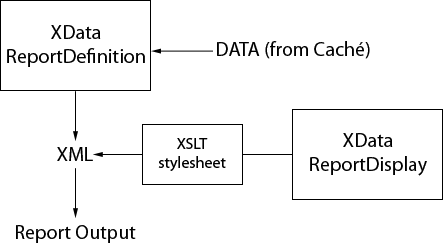 The following illustration summarizes the possible data sources, and shows the optional use of an XML stylesheet. The primary output formats for Zen reports are Excel, PDF, and HTML. Output in TIFF format is also possible. The ReportDisplay block generates a different XSLT stylesheet depending on the output format you have selected. The stylesheet is applied to the XML produced by the ReportDisplay to generate the report. Note that in the case of PDF output, the XSLT stylesheet creates an XSL-FO document which is used by the PDF rendering engine to create the final PDF output. The Caché installation provides a version of Apache FOP as a PDF rendering engine. You can also use the XEP PDF rendering engine from RenderX, or download and install FOP from Apache. HyperText Markup Language (HTML), eXtensible Markup Language (XML), XPath syntax, and Cascading Style Sheets (CSS). Many excellent books are available through the Internet and commercial bookstores. A Zen report is a class that extends %ZEN.Report.reportPage, which in turn extends the base class for Caché Server Pages, %CSP.Page. This topic explores the structure of a Zen report class by building it in gradual steps. If you have a new Caché installation, before you begin this exercise you must first run the ZENDemo home page. Loading this page silently generates data records for the SAMPLES namespace. You only need to do this once per Caché installation. Click the New Zen Report icon. The Zen Report Wizard presents the fields shown in the following table. For this exercise, enter the values shown in the right-hand column of the table. Application The package and class name of the application associated with this report. Associates the Zen report with a Zen application, which provides default values for built-in class parameters. Values specified in the report take priority. If unspecified, the Zen report uses %ZEN.Report.defaultApplication. Description Any text that you want to use to describe the report. Sample of building a new report. The New Report Wizard creates and displays a Zen report page class with predefined parameter values and the XML blocks XData ReportDefinition and XData ReportDisplay. Compile the class and view the report. The XML output now displays a much larger data set for each sales person. The aggregate elements <total>, <clients>, and <average> appear at the end of each <SalesRep> record. Now that you have structured the report data as XML, you can specify how to display this data. 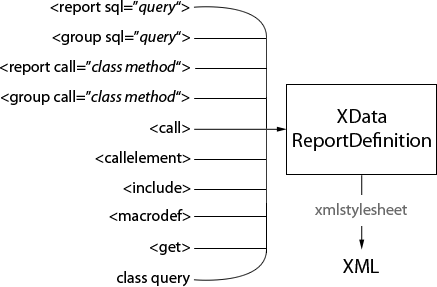 Find the XData ReportDisplay block, which follows the XData ReportDefinition block. This section contains the following default report definitions structure, which includes several optional elements. In this tutorial, you add code to the <body> element. Change the DEFAULTMODE class parameter value from "xml" to "html". Compile the class and view the report. <group name="SalesRep"> is a reference to the <SalesRep> element in the generated XML. <item field="@name"> is the syntax for referring to the <SalesRep> attribute name. <item field="total"> is the syntax for referring to the <SalesRep> element <total>.